For the most of my 16 years in this country I wanted to ride a train. There was always some excuse to prevent it from happening – it was too expensive, too long, I will have to rent a car, etc. With the gas prices where they are and with the air travel approaching the treatment and comforts of a cattle-car most of my excuses didn’t apply anymore. I took a plunge and purchased Amtrak tickets to Chicago. My overall impression – I should have done this years earlier. It was one of the most enjoyable, relaxing and fun trips I ever had. The train leaves from the East Wing of the Union Station where there is a waiting room and a ticketing counter. There is no check-in, metal detectors, shoeless walk of shame, probing, pat-downs, luggage-opening and other activities otherwise associated with a correctional facility. A passenger walks in, luggage- in-hand and boards the train. That’s it. 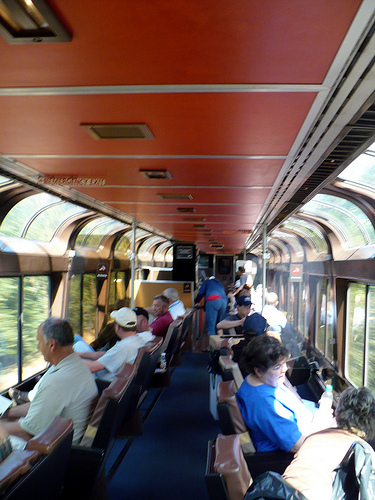 The train has coach and sleeping cars, dining car, club/lounge car with a snack bar on the lower level. 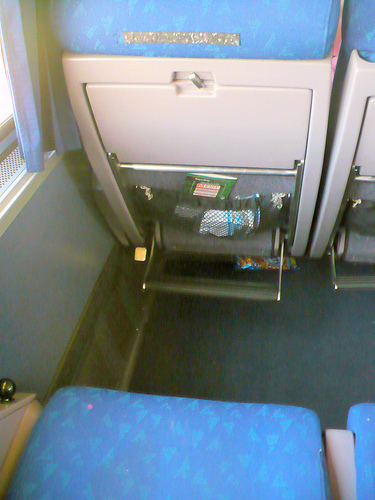 The seats in the coach car are huge, they recline and have a leg rest. The foot rest folds out from the seat in front but I had to slide down on the seat in order to reach it. There is a folding table in the front seat as well. On the way back the couch car had a power outlet for every seat. There is plenty of room on the overhead shelf and heavier luggage can be stored on the lower level of the car. The main feature is a huge window with a view. Granted, Missouri, Iowa and Illinois are not the most picturesque states to travel through but it’s still fun looking out and trying to guess what are these people doing for living in remote locations surrounded by cornfields. When tired of the views, reading and movies one can walk up to the club car where windows are even bigger and extend all the way to the top of the car. The seats ar oriented toward the windows, some are set up next to the table so people can talk or play games. Drinks and snacks are sold on the lower level. 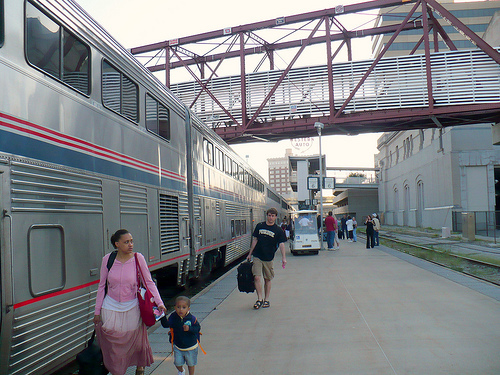 The Southwest Chief train service connects LA with Chicago. From Kansas City it takes the shortest route to Illinois which is 430 miles long and is about 80 miles shorter than driving. On the way to Chicago the train was late by about 40 min. It was doing good for the rest of the trip until there was an announcement that we are waiting on some hazardous spill to be cleaned up. Then we waited for all the other trains to move on. We were late to Chicago by little less than 2 hours. I didn’t mind. Passengers who missed their connections were offered accommodations. On the way back the train was late by 12 minutes which I consider excellent. The Union Station in Chicago is huge and alive, handling local and interstate traffic. Our station with only a few daily departures pales in comparison. Despite its size, the boarding in Chicago is just as painless. The Union Station is located in downtown Chicago, less than a mile from the Michigan Ave. The cab ride to the Grant Park area is $6-8. One advantage of not driving was my ability to relax, read and take some pictures and videos. I was surprised by many people along the way photographing the train, it seems to be a huge hobby nowadays. We even passed a special train-watching platform with the sign “RailFan.Net“. Here are a few videos that I made. Leaving Ft. Madison, IA and crossing the Mississippi River. This is somewhere in Illinois, I liked the wind farm all the way in the back. Amtrak beat all my expectations and at this time I would recommend it to anyone who likes to relax when traveling and enjoy the view. Major Update: I totally forgot to talk about pricing. Amtrak tickets to Chicago are about $50 one-way depending on how far in advance you are buying them. They also offer some discounts and specials. Additional coupon codes may be available elsewhere, I used 20% off code while paying for my tickets. Child fares are 50% off. The other important detail is that if you make reservations online you can just cancel them until you pick up your paper tickets at the station. Paper tickets are also refundable with a cancellation fee of 10%. If you park your car at the Union Station covered parking the charge is $10/night. It seems that Amtrak positioned themselves as anti-airline, with discounts, child fares, no hassle, no luggage charges and many other conveniences and comforts. The only disadvantage is travel time, but if there is no hurry, this is the way to go.